Malaysian Minister of Transport Liow Tiong Lai, center, speaks at a press conference during MH370 missing plane search operations signing ceremony between the government of Malaysia and the Ocean Infinity Limited in Putrajaya, Malaysia, Jan. 10, 2018. 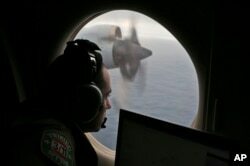 The Malaysian government has signed a deal with a U.S. exploration company to resume the search for the missing Malaysia Airlines MH370 in the southern Indian Ocean. Transport Minister Liow Tiong Lai announced Wednesday in Kuala Lumpur that Houston-based Ocean Infinity will search for the missing plane under a "no-find, no-fee" contract, meaning it will only be paid if it finds the Boeing 777 jetliner. The company will be paid $20 million if the plane is found within 5,000 square kilometers, $30 million if its found within 10,000 square kilometers, and $50 million within a 25,000 square kilometer area. The fee will be $70 million if it finds the missing plane beyond the 25,000 square kilometer area. Malaysia Airlines MH370 vanished on March 8, 2014 during a flight from Kuala Lumpur to Beijing, carrying 239 passengers and crew. Malaysia joined forces with Australia and China in a three-year, $160 million search for the jetliner that was called off last January after covering a 12,000 kilometer area. The search was called off in January, with no trace of the plane found, except for three separate pieces that washed ashore at various points along the Indian Ocean. Ocean Infinity has deployed a search vessel, the Seabed Constructor, to a 25,000-square kilometer area directly north of the original search area. Investigators recommended moving the search efforts to that area, but it was rejected by the three nations because of what they said was a lack of convincing evidence. The Seabed Constructor is expected to arrive at the new search area in a week. The search is expected to last for 90 days.